It is an undeniable fact that neck tattoo is one of the body tattoos that can be found in many people all over the world. Having this tattoo on your body is really a matter of thorough decision making since the neck part is very visible. There is no way you can conceal your tattooed neck at most times. This goes to show that before getting tattooed on the neck, you need to make sure that you have already thought about it over and over. Keep in mind that there are lots of things you need to consider before going into it, especially regarding your professional life. Of course, there are different reasons why people are going for neck tattoos. One common reason is to grab the attention of many people. People who have tattoo on the neck area simply just want to be the centers of attraction. For women, they are doing this because they want to attract the opposite sexes. This goes the same with men, of course. Some people also decided to get some tattoos on the neck because they don’t want to wear jewelries anymore. In other words, they replaced jewelries with gorgeously designed tattoos on the neck. Other people get tattooed because this is how they want to express themselves to some other people who are surrounding them. Lastly, the reason why some people go for them is because of their religion. This is how they show their devoutness to their religion. You can display your personality well. You don’t even have to speak so that you will be known to somebody. Your tattoos are enough to speak on your behalf. You will be a head turner. Wherever you go, people will certainly notice you because of your gorgeously designed tattooed neck. With that being said, you can surely satisfy yourself, especially if you’re aiming to be popular. You will be an image of fashion. For those people who consider tattoos as great fashion symbols, you will surely appear as a great fashion icon whom they will look up to. You may be considered as a bad example. The society today is still composed of very conservative religious people who see tattoos as demonic symbols. To them, it is expected that you will appear a bad example. It is more painful. 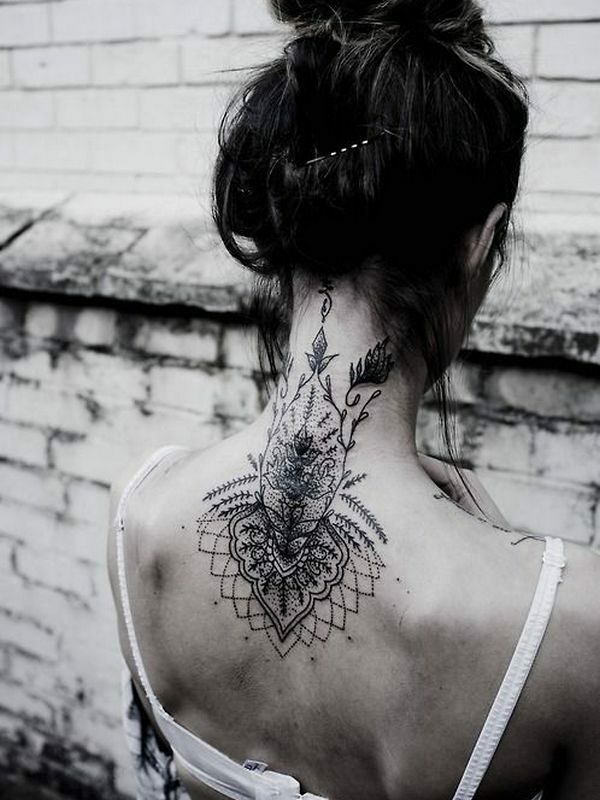 Compared to some other parts of the body, the neck part will transmit more pain when getting tattooed. To know more about pain click here for answers. David Beckham – David is a famous worldwide image of the football world. One of his gorgeous tattoos on his neck is a cross winged tattoo. It is exactly located on the back portion of David’s neck. He also has a “Butler” tattoo in the right side of his neck. At the lower part of his left neck, he has “Pretty Lady” and “Harpers” tattoos. Angelina Jolie – This extremely popular humanitarian celebrity made her goodness transformed into tattoos. At the back portion of her neck, a gothic-lettered tattoo can be seen that goes, “Know Your Rights”. Rihanna – This very famous Barbadian-born Hollywood singer has a group stars tattooed on the back portion of her neck. Pink – Alecia Moore or famously known as Pink. She has a bar code tattoo engraved on the back portion of her neck. The primary consideration before having a tattoo inked is about its placement, whether the tattoo is placed in a visible area or somewhere it can be concealed when desired. The decision has to be particularly well made one in the former case as it is impossible to hide the tattoo, however vital it is to do so. Some of such tattoos are face and neck, which are greatly visible and gradually, become a part of the bearer’s personality as a whole. They are usually featured on the nape of the neck or its side going parallel to the jawbone and these tattoos are gradually gaining popularity all over the globe. While women have the option of covering them up with a long mane of hair, men cannot generally do so. These tattoos are also inked on sensitive areas, which mean that one has to bear a great degree of pain for them, which makes the matter of having them inked even more crucial. 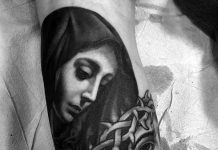 At the same time, they make a hot favorite among the newer generation for the plain reason that they look cool and trendy, whether they are inked on men or women. 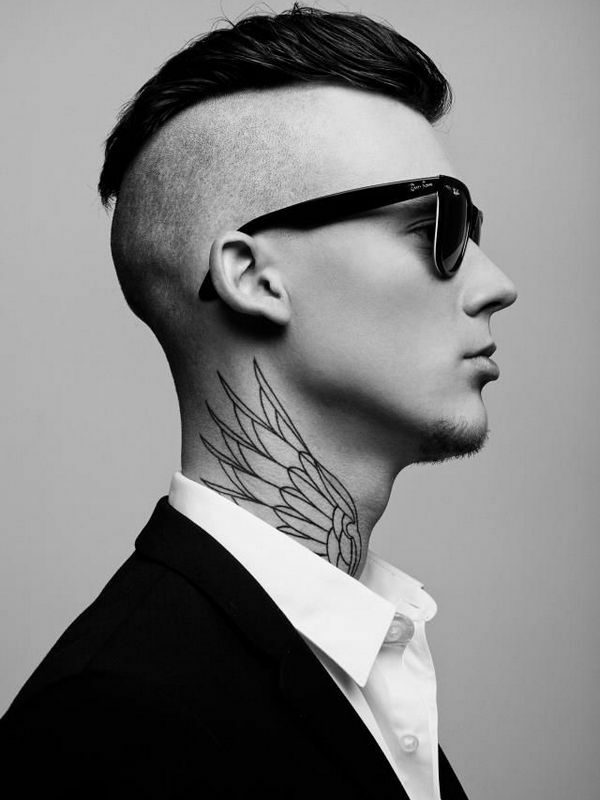 A tattoo on the neck area is so popular because it enhances the personality of the bearer and literally screams his attitude to the whole wide world. However, bear in mind that such a tattoo design is going to be permanently visible, which may cause problems with your professional life later on. Also, the pain of having it inked is going to be excruciating. But sometimes the fruits of labor give extraordinary results, which is the case with these amazing designs. The basic purpose of having a tattoo etched is to grab attention, which is a task well done with the help of neck tattoos. The fact is that these tattoos may be highly visible as well as quite painful, but this, in no way, affects their popularity as they enhance one of the sexiest parts of your body. It is a great way to enhance the shape of your neck and even draw each eye towards your facial features. At the same time, there may be another purpose of wearing a tattoo on the neck area, which is to make it a replacement of jewelry pieces, such as necklaces and chokers, as these are common designs used in neck tattoos. As said before, they make the most visible form of tattoo art, which makes it really important to decide the type of tattoo you are going to have in this area as it is going to make a big difference regarding the presentation of the tattoo to the world. The placement of the tattoo itself makes it bolder and daring as it is hard to cover the same. The ones on the nape might have a chance of being covered on some occasions, with the help of long hair or a high collared dress, but the same does not apply to such tattoos which are inked on the side of the neck. These are for those who have a care a damn attitude and are actually not bothered at all what others think of them. In fact, they are for those who want to say, rather scream out their attitude to the whole world. Back of the neck is a best spot to inked with a tattoo which is both visible and easy to cover up when you don’t want it to be seen. So they are not problematic and one of the less painful to get inked. However, the back of the neck can easily be hidden by hair, collars, or a scarf, so to show our appreciation for hidden gems of art, here we have some of the cutest back of the neck tattoos that we found. They are basically for the bold ones, who have courage and attitude enough to say their attitude loud and clear. Both men and women go for such tattoo designs, but there are some which are more suitable for each of the sexes. 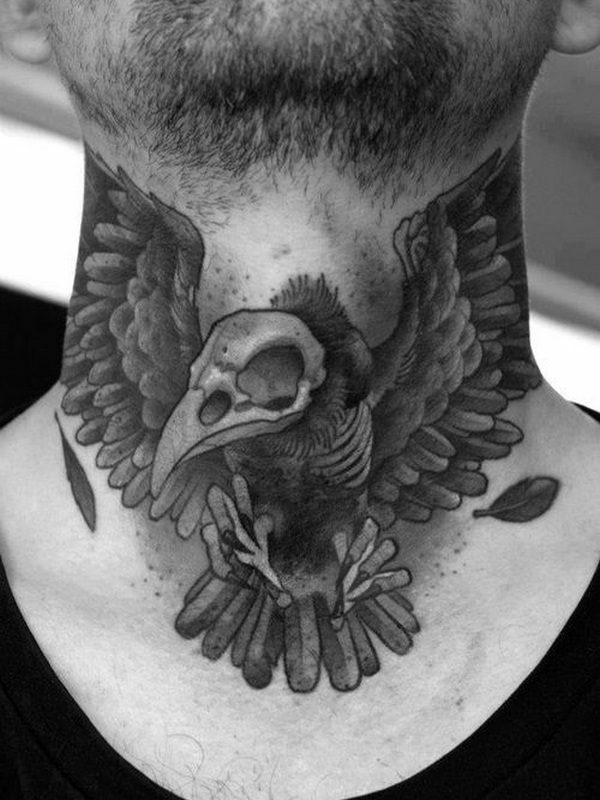 Men go for wilder and crazier designs when it comes to tattoos on the neck as they are all about being bold and aggressive. These may include religious designs such as the cross or something weird as the spider. For those who are in love, a lip kiss tattoo or heart tattoo may be something preferred. Some go for the name of a loved one or other kind of text message such as name or famous quotation inked on this area. Another option among men is something of an evil tattoo design, which may feature skull and arrows. One of the most popular design among celebrity is the one featured on the back of soccer star David Beckham’s neck. 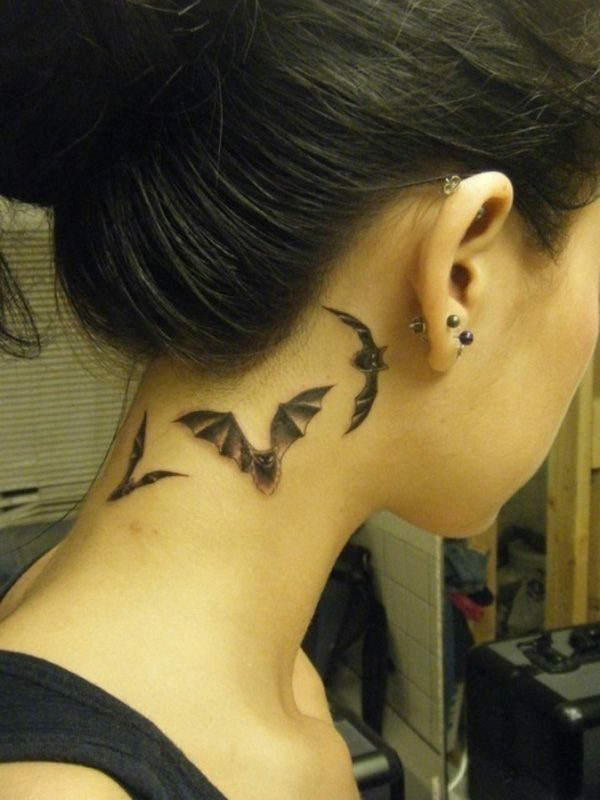 The tattoo includes a Gothic style cross along with wings, making it a prominent feature on his neck. While tattoos on the neck in men are meant to make a show of their masculinity, such tattoos for women need to be delicate and feminine as they are a visible feature of one’s personality. Women may choose dainty options such as beautiful flowers designs, birds designs, butterflies design , dragonfly design, musical objects, feathers, anchors, dreamcatchers, angel wings, animals, crowns and jewelry pieces such as chokers and necklaces, bows, hearts, etc to have inked at the neck area. They can also get names and other text in the tattoo design for the neck. 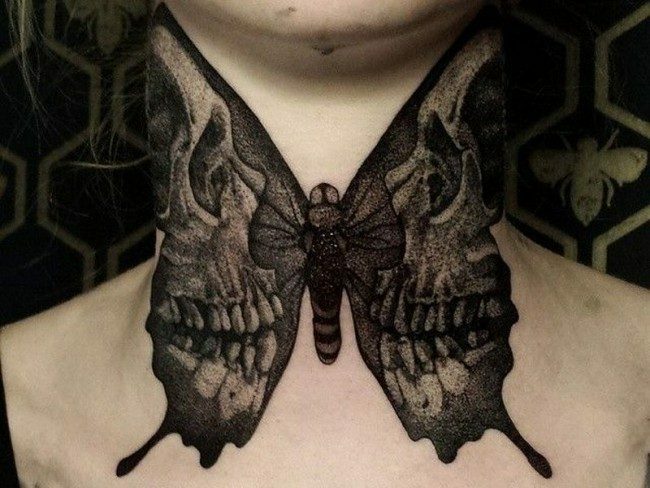 Design for a neck tattoo should be chosen after great care and contemplation as it is going to catch the attention at the first glance itself. One can also look for the advice of a creative tattoo designer, who can suggest something which reflects the attitude of the bearer, and at the same time, has the aesthetic value to attract the onlooker. Would you like to check our collection of White Ink tattoos? Devil and Rose – This is a tattoo design that is composed of a devil image like a skull and of course, a beautiful rose flower. You can actually make it smaller, depending on your preference. But if you want to catch the attention of many, a bigger Devil and Rose design is great. Mother Love – This design is composed of a woman image and a rose flower. The woman face’s image will be the mother design of the tattoo, while the rose will symbolize the love that is why it is called Mother Love. Red Skull – This design is made of a human skull that is colored with red ink, of course. This will surely show the rebellious personality of the wearer of this tattoo. This design will also exude extreme bravery. Organic Skull – It is a skull tattoo design that is colored with green in order to capture the essence of organic. The skull is incorporated with plant designs. The skull looks surrounded with some plant leaves. Lilo and Stitch – This tattoo design is perfect for those people who are fond of cartoon characters. This will surely flaunt the soft side of your personality. Bird Heart – This tattoo is composed of a bird that is engraved with different colors on its wings part. At the center of the body of this bird, a big red heart shape is engraved. This is why it is called Bird Heart. Neck is one of the most visible areas on the body and this is the reason why tattoos on the neck need to be chosen with care as they are hard to conceal and draw a great deal of attention on the first glance itself. The most important factor is to choose a design with care; it should reflect your true attitude but in the positive sense. Therefore, men and women should make a good research and choose an expert artist who can guide them regarding the right design and placement. Getting a tattoo on the neck area is a very big decision for any man or woman and it is better t think a lot before taking the leap as it is something which is going to become a part and parcel of your personality and people are going to make use of it for recognizing you. What is of real concern is the design and effort should be made that it should be a depiction of one’s attitude in a positive manner, rather than something which shows rebellion and negativity. 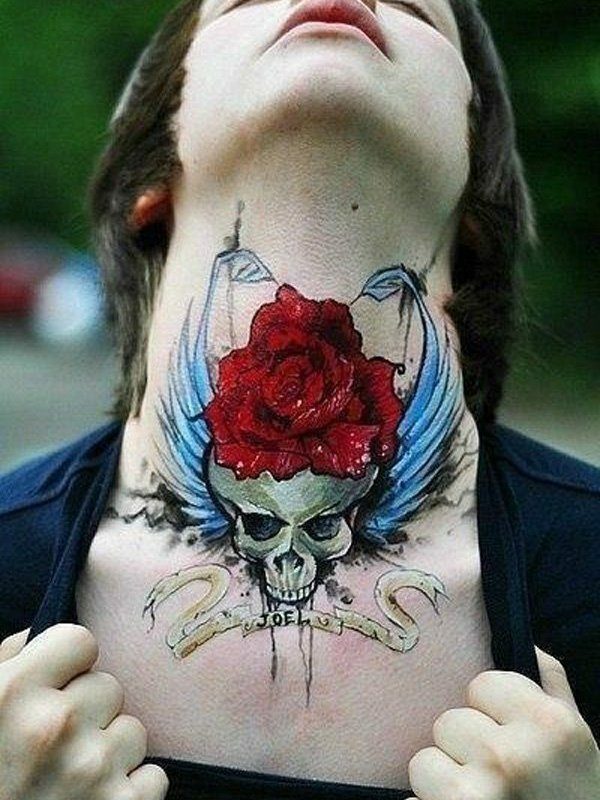 Bearing a tattoo on neck area is a matter of commitment and one should be sure about everything before going ahead. 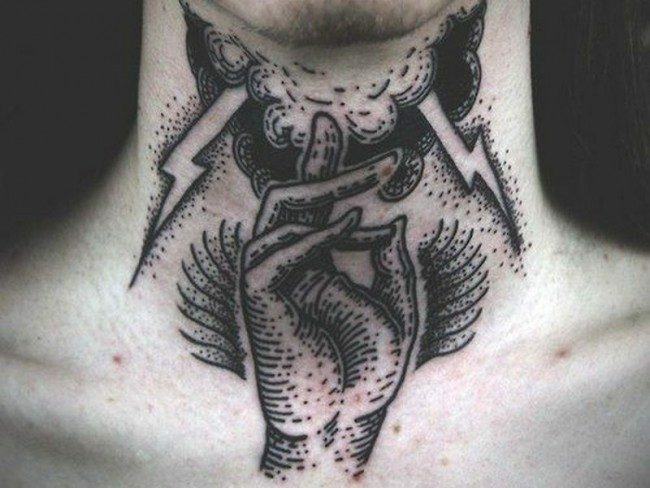 Without a doubt, getting a neck tattoo will surely enhance your fashion sense, and will display your braver personality. Even so, always remember that it may also come with some disadvantages that you might don’t like experiencing. 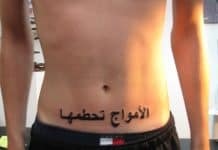 This goes to show that you have to think about it well before deciding to finally have it on your body.